Pentaho and SQL Server articles ! JPivot is one of rich features OLAP clients in the market that comes up with web based interface. Its capability to run in multiple platform and compliant with XMLA standard as its data source make JPivot a viable and affordable solution for every organizations that already implemented XMLA OLAP server but needed more robust client solution. MS SQL Server 2000 and MS 2000 Analysis Server is one of the mostly wide used database and OLAP server in enterprise market. And since Microsoft is also the initiator in this XMLA technology, it is not surprising that MS Analysis Server also support the standard. But the drawback is that both products don't come out with any OLAP client. Hence, since JPivot is XMLA compliant we can use it nicely to fill the gap. 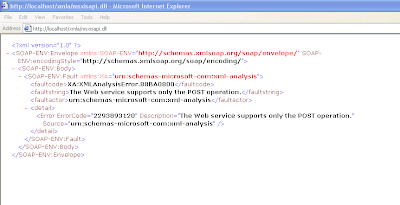 First you need to download Microsoft XMLA sdk and set it up with IIS and MS Analysis Server. I will not go through this step as you can see more detailed instructions in this MSDN article. 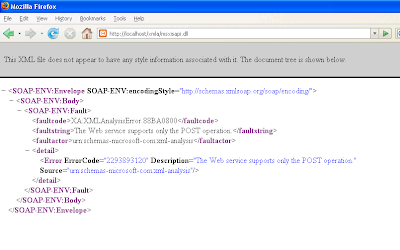 or if you are using Firefox you may get result like in figure 2. 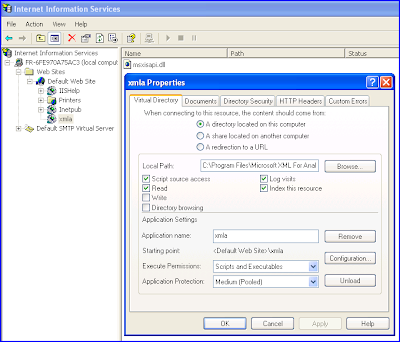 Figure 3 is a screenshot of my IIS config for this xmla virtual directory. Now you can create a flat jsp file named salesCube.jsp and put it into your $JPIVOT/WEB-INF/queries folder. In my case the folder is located in C:\apache-tomcat-5.5.17\webapps\jpivot\WEB-INF\queries. Pay attention to above listing for uri and catalog attribute of jp:xmlaQuery tag. For uri we will use the msixisapi.dll reference url that we already tested before. 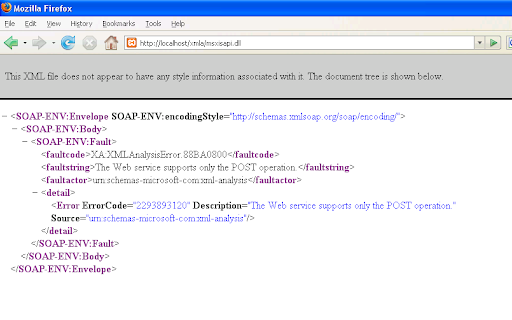 And for catalog I'm using Tutorial which is Ms Analysis Server catalog for Foodmart database sample. 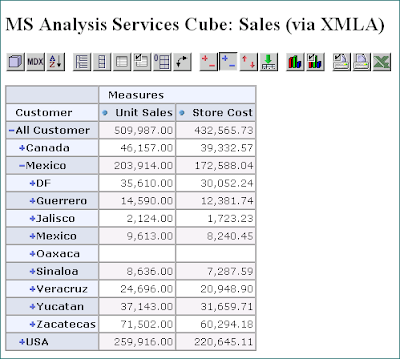 Make sure that in this example you already have setup Sales cube with Unit Sales and Store Cost measures and Customer dimension. Get the result by executing http://localhost:8080/jpivot/testpage.jsp?query=salesCube in your browser. If everything working fine you will get the result like figure 4 and figure 5 below. Enjoy the great features of JPivot including drill down option and graphichal cart generation. JPivot is an OLAP web based client that can work perfectly with XMLA standard OLAP provider like Microsoft Analysis Server 2000. You will need an additional installation of Microsoft XMLA SDK and a virtual directory IIS configuration to make it work. 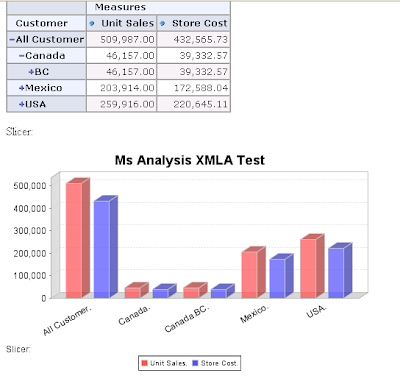 Here I have shown how you can consume MS Analysis's OLAP source using XMLA with a standard JPivot installation. Create a jsp file, specify your jp:xmlaQuery tag's attributes and specify an MDX query. You now have all the rich features of JPivot.